Now compatible with Discrete 4, Discrete 8, Orion Studio Rev2017, Orion Studio, Zen Tour, Orion 32+, Goliath HD, Goliath and Zen Studio+. The initial version of the Antelope Audio Windows Thunderbolt driver is now officially released! The driver is stable, fast and maintains low latency levels even in busy sessions. It’s under active development, and future versions will resolve the current limitations. We’d like to thank our Beta testers who helped us a lot in improving the driver during its six-month Open Beta period. Discrete 4, Discrete 8, Orion Studio Rev2017, Orion Studio, Zen Tour, Orion 32+, Goliath HD, Goliath, and Zen Studio+. * 0.995ms measured on Discrete 8 using PreSonus Studio One 4, 192kHz, 64 samples buffer, streaming mode set to “Fast”. We’d like to thank Vin Curigliano of AAVIM Technology for his wonderful work on DAW Bench and the Low-latency Performance Database, and for measuring the Discrete 8 and giving us feedback on improving the product. *** We recommend using the VB-Audio VoiceMeeter Virtual Audio Mixer. 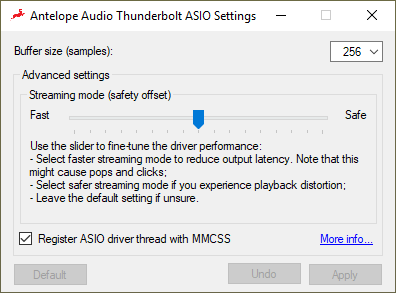 This tool creates a virtual Windows Audio device which can use the Antelope Thunderbolt™ ASIO as a playback engine. We’d like to thank Vincent Burel of VB-Audio for creating this wonderful software, and for his support during Antelope Windows Thunderbolt™ driver development! We’d like to ask you to support VB-Audio by making a donation! Want to be part of the most recent upgrades and bug fixes? Check out the Thunderbolt™ BETA driver development below. The driver is under active development and new versions will be first made available on this page. Please follow our news page for any updates. Make sure you have “Thunderbolt™ Software” installed. Download and install the latest Antelope Audio Windows Thunderbolt™ Driver. Connect the device. A warning will appear stating “This device may not work properly”. The warning appears because the device is not yet certified for Windows, you can safely ignore it. A prompt may appear to ask if the device can connect. Select “Always Connect”. Download and install the Antelope Launcher. Open the Antelope Launcher and update. You should be ready to go. Configure your device from the Control Panel and use your favorite DAW to playback and record! Please note that Windows Audio is not yet supported, only ASIO. We recommend using the VB-Audio VoiceMeeter Virtual Audio Mixer. What do I need to connect my device via Thunderbolt™? You’ll need a computer, equipped with a motherboard that supports Thunderbolt™. If the motherboard doesn’t have a Thunderbolt™ port, you’ll also need a Thunderbolt™ AIC (Add-in Card). You’ll need a Thunderbolt™ 2 cable. If the port on your computer or AIC is Thunderbolt™ 3 (Type-C) you’ll also need a Thunderbolt™ 3 to Thunderbolt™ 2 adapter. My computer doesn’t have a Thunderbolt™ port. Can I install a Thunderbolt™ AIC (Add-in Card)? It depends. Thunderbolt™ requires explicit support from your motherboard. Check your motherboard specifications or contact the manufacturer to see if it supports a Thunderbolt™ AIC. I have a computer with USB Type-C port, will the driver work? It depends. All Thunderbolt™ 3 ports are Type-C. However, not all USB Type-C ports support Thunderbolt™. Type-C ports that do so will have the Thunderbolt™ logo besides them. It’s best to check your motherboard documentation to see if your port supports Thunderbolt™. My motherboard doesn't have a Thunderbolt™ port, but supports Thunderbolt™ via an AIC (Add-in Card). What Thunderbolt™ AIC should I use? It’s best to check with your motherboard manufacturer for a list of supported AICs. Typically, you can use an AIC from the same motherboard manufacturer. Do I need to change any BIOS/UEFI settings in order for Thunderbolt™ to work with the device? Usually the default settings are OK and the device should be able to connect. There might be Thunderbolt™ settings that can prevent the device from connecting. The first one is “Thunderbolt™ Security” or ” Thunderbolt™ Authentication”. It should be set to “None” or “User” – depending on the motherboard. The other one is for Thunderbolt™ PCI support. This one should be enabled. Also, USB power-saving features might prevent Thunderbolt™ from working, so you might need to disable them. What Thunderbolt™ 3 to Thunderbolt™ 2 adapter should I use? We recommend the StarTech Thunderbolt™ 3 to Thunderbolt™ 2 Adapter. You’ll need a Thunderbolt™ 2 cable. We recommend the Apple Thunderbolt™ Cable, or if you need a longer cable – the Corning Optical Thunderbolt™ Cables. Is there a list of tested configurations? Every computer with a Thunderbolt™ 2 or Thunderbolt™ 3 support should work. My device is not discovered or recognized. • Try switching cables or adapters. We recommend Apple or Corning cables, and StarTech Thunderbolt 3 to Thunderbolt 2 adapters. If the device is not recognized when connected before the computer is started, but recognized otherwise, please try a different Thunderbolt 3 to Thunderbolt 2 adapter. If the device is recognized by the Intel Thunderbolt Software, but does not appear in Device Manager, allow the device to connect from the Intel Thunderbolt Software. • If the problem persists, manually select the driver: right click on the device, select “Update driver”, select “Browse my computer for driver software”, select “Let me pick from a list of available drivers on my computer”, select “Have Disk”, and navigate to “C:\Program Files\Antelope Audio\Thunderbolt\AntelopeAudio.inf”. Changing the current Power Plan during playback / recording is not supported. Please select and configure your Power Plan before starting playback / recording session. Run “regedit”. Go to HKEY_LOCAL_MACHINE\SYSTEM\CurrentControlSet\Control\Power. Create a new Key “PowerThrottling” if not present, and a new DWORD value “PowerThrottlingOff” under the key, then set the value to “1”. Restart the computer. Use the Streaming mode slider to fine-tune the latency. Please note that the lowest achievable latency values depend on the computer configuration, as the Antelope driver is sensitive to Interrupt, DPC and scheduling latencies – these can vary depending on the hardware and installed third-party drivers and applications.